(2010) "I Don't Deserve You"
(2010) "Can a Drummer Get Some"
(2010) "You Be Killin Em"
"Start It Up" is the third single from Lloyd Banks' third album H.F.M. 2 (The Hunger for More 2). The song features Swizz Beatz, Kanye West, Ryan Leslie & Fabolous, it was produced by Cardiak. The song was released as a digital download on November 2, 2010. In an interview with Rap-Up, Banks explained that Swizz Beatz was not originally on the chorus. At first it was thought that Kanye West had produced the track, but it was later confirmed that it was up and coming producer named Cardiak. A testament to the fast-paced music industry in 2010, Banks said, "The difference from that track being me and Fab and having Kanye was 24 hours." The official remix keeps Kanye's and Fabolous's verses, but adds a verse from Young Jeezy and a new verse from Lloyd Banks. In an interview with DJ Whoo Kid on Sirius Radio, Lloyd Banks confirmed that a music video will be made for the song, but a date has not been confirmed. It is believed that the video will feature Swizz Beatz, Kanye West, Ryan Leslie & Fabolous. It had been confirmed that Lloyd Banks was shooting his part for the video on November 12, 2010. Via Twitter it was confirmed that the G-Unit Riderz would make a cameo appearance in the video. However it is believed that because of the difficulty of getting the artists together at one time there may be no video. ↑ "Start it Up Single". 50 Cent Official Website. Retrieved 2011-02-18. ↑ "Lloyd Banks Interview". 50 Cent Official Website. Retrieved 2011-02-18. ↑ RapUpTV (25 October 2010). "Lloyd Banks Weighs in on Competing with Kanye & Nicki Minaj". YouTube - RapUpTV's Channel. Retrieved 2011-02-18. ↑ "Start It Up (Prod by Cardiak) [Dirty][CDQ] - Song by Lloyd Banks". Hot New Hip Hop. Oct 11, 2010. Retrieved 2011-02-18. ↑ J-23 (Oct 8, 2010). "Lloyd Banks Tells The Story Behind The Kanye West-Assisted "Start It Up"". Hip Hop DX. Retrieved 2011-02-18. ↑ "Lloyd Banks – Start It Up [Official UK Remix]". 100 percent UK. Dec 3, 2010. Retrieved 2011-02-18. 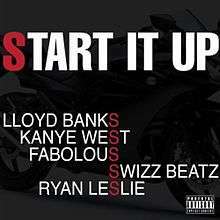 ↑ "Lloyd Banks – Start It Up f. Kanye West, Fabolous, Swizz Beatz". 2dobeboyz.com. Dec 7, 2010. Retrieved 2011-02-18. ↑ "50 Cent Official Twitter". Twitter. 2010-10-30. Retrieved 2011-02-18. ↑ "Lloyd Banks Calls into DJ Whoo Kid Speaks On Eminem,Shooting A Video For "Start It Up",Akon and More". YouTube - GunitsSoldierTV Channel. 2011-10-31. Retrieved 2011-02-18. ↑ "Twitter". Twitter - GUNIT_RIDERZ. 2010-11-01. Retrieved 2011-02-18. ↑ "Twitter". Twitter - GUNIT_RIDERZ. 2010-11-12. Retrieved 2011-02-18. ↑ "Bubbling Under Hot 100 Singles – Issue Date: 2010-12-11" (requires registration). Billboard. Prometheus Global Media. Retrieved January 16, 2012. ↑ "Lloyd Banks – Chart history" Billboard Hot R&B/Hip-Hop Songs for Lloyd Banks. Retrieved January 16, 2012. ↑ "Start It Up at Amazon". Amazon. November 2, 2010. Retrieved 2011-02-18. ↑ "Lloyd Banks Start It Up Single". 50 Cent Official Website. November 30, 2010. Retrieved 2011-02-18. "How It Was Supposed to Be"